Two doomed lovers kept apart by the strict class system of their era, fighting to be together as disaster looms. Plus there’s a scene with handcuffs and a haunting love theme at the end. 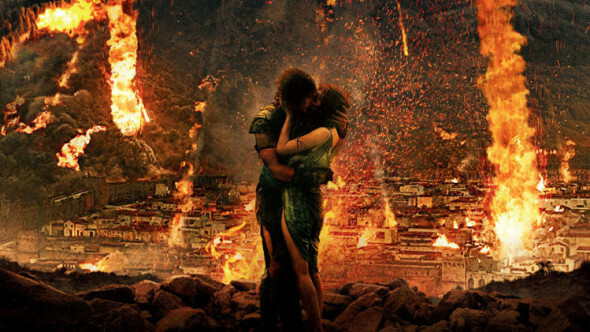 This remake of Titanic is called Pompeii, with a CGI Mt. Vesuvius showing tremendous range in the role of the iceberg. The smoldering Milo (Kit Harington) is a gladiator/slave who catches the eye of Cassia (Emily Browning) , the daughter of a wealthy Pompeii businessman. Trouble is, she is unwillingly betrothed to the menacing Corvus, a visiting senator from Rome (Keifer Sutherland, unapologetically hammy). As Milo and the other gladiators begin combat in the crowded arena, Vesuvius uncorks in very angry fashion, leaving an entire city scrambling for a seat on one of the boats to safety..seriously. There’s just no way to watch this film without thinking of Titanic, except in the moments when a Sutherland is standing before a crowd to “open the games” and then you’re thinking of The Hunger Games and wouldn’t you rather be watching that? Director Paul W.S. Anderson (Resident Evil series, Event Horizon) is a bit lost in the quieter scenes, as if he’s just impatient, and hankerin’ to get back to the action. The abundance of shirtless hunks, along with Anderson’s knack for keeping M’lady cleavage in the frame whenever possible rank as weak attempts to keep attention from waning. He’s much more at home creating a spectacle, and once the volcano erupts and madness ensues, Anderson does manage a few scenes that are visually impressive. So there’s that. Still, Pompeii continues to ignore the most pressing issue. Wasn’t there enough room on that piece of shipwreck for both Jack and Rose?